In the early 1990’s, jet skiing reached its peak in popularity. Today, it still is a widespread trend among all age groups, because of its affordability and speed. 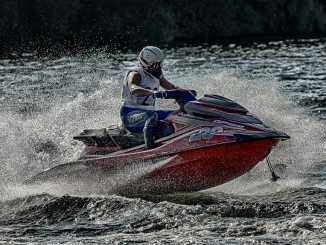 Though it is advertised as being easily handled, most people who ride a jet ski for the first time are unaware of how to maneuver a personal watercraft or PWC. Jet skis, unlike other vessels or vehicles, do not have a braking mechanism. As a result, many people are injured every year because of their lack of steering knowledge. A jet skier is 7.2 times more likely to get hurt than a motor boater and 31.6 times more likely than a canoer or kayaker, according to a survey commissioned by the U.S. Coast Guard and published in 2002. If you or someone you know has been injured in a jet ski or PWC, accident because of someone else’s carelessness, contact a San Diego PWC injury attorney immediately to get the money damages you deserve. Our lawyers are dedicated to helping you seek reparations for your injuries. Jet Skis Do Not Have A Braking Mechanism. As a Result, Many People Are Injured Every Year Because of Their Lack of Steering Knowledge. Personal watercraft, also known as PWCs, has become a popular pastime in the warm San Diego waterways. PWCs are small, fast, easily handled, affordable, and their propulsion systems do not have external propellers, making them safer for swimmers and wildlife. However, accidents are common. Though jet skis are no more dangerous than any other watercraft, it is the way that people operate them that causes many injuries. Jet ski riders have a high risk of being ejected and drowning. Research from the University of Florida shows that jet ski accidents cause greater injuries than other boating mishaps. The study found that patients sustain more closed-head injuries, trauma to the chest and abdominal injury riding jet skis. All of these types of injuries tend to be serious and may induce unconsciousness and end in drowning. What adds to this cycle is the fact that jet ski injuries are one of the least publicized dangers in the recreational boating industry. Hence, most people do not properly educate themselves on the correct way to operate a jet ski because they are unaware of the dangers. Operator errors can be deadly because jet skis are designed to achieve speeds of more than 60mph. This may result in a loss of stability and increased risk of flipping over. However, one of the most compounding reasons for jet ski accidents is that they do not have a braking mechanism. Instead, the operator must keep the throttle down and actually accelerate to turn quickly and avoid hazards in the water. Though, the natural tendency of most operators is to slow down when facing a hazard. Because this reduces the thrust from the jet nozzle, the operator often cannot turn the craft in time, resulting in a collision with another boat, a dock, a swimmer or the shoreline. A jet skier is 7.2 times more likely to get hurt than a motor boater and 31.6 times more likely than a canoer or kayaker, according to a survey commissioned by the U.S. Coast Guard and published in 2002.